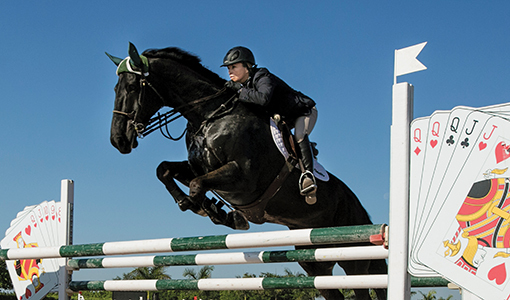 Only in Wellington would you see this warning sign: “No texting while mounted on a horse.” Just west of Palm Beach, Florida, Wellington is home to the Winter Equestrian Festival, the largest event in equine sports. For 12 weeks every January through March, a series of horse shows awards $8 million in prize money to some of the world’s most accomplished riders and their equine athletes. The festival is also a proving ground for other prestigious competitions, including the Olympics. It’s a horse lover’s paradise. Pristine white fences and palm trees border sprawling estates dotted with palatial stables, paddocks and jumps. Grassy paths accommodate throngs of horses and riders heading to and from the show grounds on streets named Appaloosa Trail, Paddock Drive and Equestrian Way. At the Palm Beach International Equestrian Center, row upon row of white tents serve as temporary stalls for some of the 2,500 horses that compete each week. The show rings stretch across 80 acres—bigger than 60 football fields—surrounded by restaurants and shopping booths with high-end brands, such as Hermes. In one ring, hushed spectators watch horses demonstrate the intricate, balletic movements of dressage as they respond to imperceptible cues from their motionless riders, who guide them by the slightest touch of leg and hand. In the international arena, bordered with flags of competitor nations and boasting a Jumbotron, horses and riders soar over obstacles, trying to “jump clean” as fast as possible. The thump of hooves, rhythmic equine breathing and applause fill the air. at Cummings School, is on call for the first time. 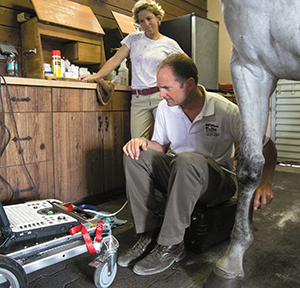 While there are many veterinarians in Wellington, dedicated equine ultrasonographers are rarities. The school aims to make its imaging expertise a go-to resource for the many equestrians who live and compete here. Ultrasound can identify a potentially serious injury that otherwise might be underestimated. He stoops to examine a bay with three white socks who has displayed lameness in his left hind leg for several weeks. The 13-year-old Canadian Warmblood, he notes, is a little straight in his rear legs; this lack of “angulation” (the angle of bones at a joint) means the hind limbs can’t absorb the impact of movement as well as they should, putting the horse at risk for injury. An ultrasound shows some thickening of the suspensory ligament, but it’s hard for Tenney to determine how recent or active the problem is. Before assessing the horse’s future prospects, he advises the owner that he’ll need to compare the new ultrasound images with the animal’s previous records. Later, Tenney examines Christian Grey, a silvery gelding owned by Liz Maloney, V92, who practices equine medicine in Franklin, Massachusetts, and often refers clients to Cummings School. She wanted to be a lion tamer as a girl, but abandoned the circus ring for the show ring, where she competes in the amateur owner jumper division at venues like the WEF. “I like to go fast, jump high and hopefully stay on,” she laughs. The decision whether to spend tens of thousands of dollars to buy a show horse may hinge on Ober’s opinion. At an expansive Wellington farm where the dressage ring has a mirrored wall reminiscent of a ballet studio, Ober examines an 11-year-old Dutch Warmblood that a client from his hometown in Virginia is considering buying. The chestnut is reluctant to be examined or bridled and repeatedly tosses its head. Some would dismiss such head-shy behavior as a quirk, but Ober suspects the horse is guarding itself against pain. He ultimately discovers an unexpected problem: “kissing spines,” a condition in which the vertical bones attached to the top of the vertebrae are so close together they cause pain. While treating elite equine athletes is a big part of what goes on in Wellington, one morning Tenney heads to a training program run by the nonprofit Dressage4Kids to talk to young riders about how ultrasound can help diagnose and prevent injuries. “Don’t just come to the barn and ride,” he urges the students, most of them in their teens. “Do some hands-on care. Get to know your horse.” As he talks, a young woman plants kisses on the nose and cheek of the horse she’s grooming. When he finishes, Tenney accepts a mug, a ribbon and enthusiastic applause from the next generation of Wellington equestrians. Kim Thurler, the director of public relations at Tufts University and a lover of horses, can be reached at kim.thurler@tufts.edu.